As you know, the term "subluxation" is used by Doctors of Chiropractic to depict the altered position of the vertebra and subsequent functional loss which determines the location for Chiropractors to perform spinal adjustment. 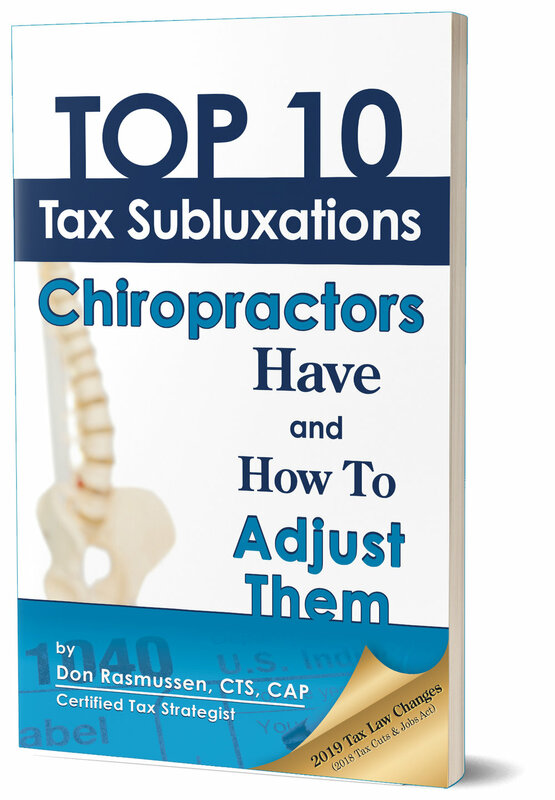 When it comes to the subject of taxes, we look at tax subluxations as the lack of effective tax planning. This in turn creates financial loss and pain with unnecessary overpayment of taxes. If you're like most Chiropractors, you are overpaying on your taxes, maybe tens of thousands or more per year than the law requires. Our tax code is thousands of pages long, with tens of thousands of pages of regulations, and there is probably no one alive taking advantage of every tax break they're entitled to, simply because there are so many of them out there. And most tax advisors are not very proactive when it comes to saving their clients' money, so you just need a better plan. In this book, we are going to talk about some of the biggest mistakes that Chiropractors make when it comes to their taxes. Then we are going to talk about how you can solve those problems... legally and ethically. Where would you like us to send your book? Please use the best number to reach you. THANK YOU FOR REQUESTING YOUR BOOK! Your order is being processed and you will hear from us soon. Inside Of This FREE Book, Here Are A Few Topics That Will Help You Avoid Overpayment of Taxes ..